How do you feel when your friends gloat online about glamorous vacations and expensive homes? If images of exaggerated wealth somehow make you feel less successful, you’re not alone. According to a StreetWise quarterly tracking study, 47% of the experienced investors surveyed believe images of exaggerated wealth make them feel less successful. That figure jumps to 69% for women under 30. In addition, more than half of the women under 30 surveyed believe that worrying about finances negatively affects their relationships and health. What can be done to relieve the financial anxiety that some women—particularly younger women—feel when it comes to finances? 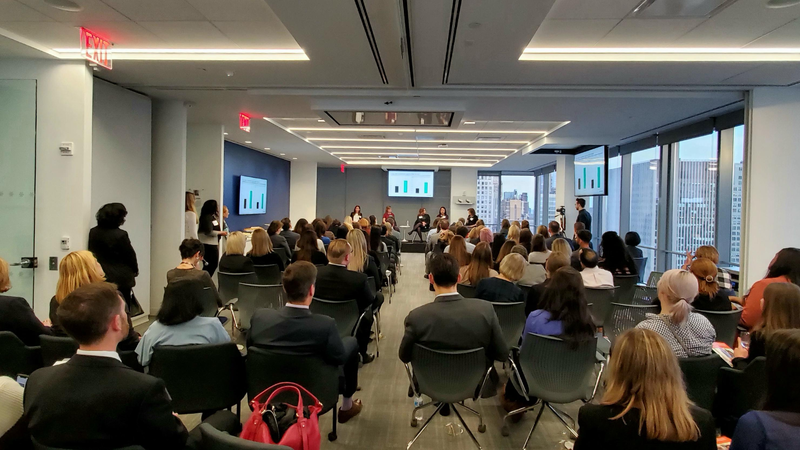 Last week, E*TRADE hosted a panel discussion at its New York headquarters to discuss themes around women and investing. In front of a capacity crowd, five distinguished investment professionals shared their personal experiences and offered professional insights. Below, we’ve included some of the highlights of the discussion. Virtu Financial’s Christy Oeth expressed disappointment that there’s so much mystery around investing—particularly given the abundance of resources in the information age. Part of the problem, according to Dress for Success Worldwide’s Wendy Longwood, is that women don’t always see themselves as investors. Almost all of the women in our financial education programs ... initially said they thought investing was for someone else. In many cases, they thought it was just for the ultra-wealthy. So, what’s the recipe for getting women more engaged about finances? One idea, said the participants, is to personalize investing from a woman’s perspective. Women often get more serious about investing during major life events, added Matthews Asia’s Teresa Kong. “When you make that first appointment for your sonogram, that’s when everything kicks in,” said Kong. “Women start to ask themselves, ‘Do I need a bigger house? Do I need to add a room?’ Financial services products could really be aimed at solving specific life issues for women." The StreetWise study also reported that younger women tend to be more bearish than most investors. Ryan says women who’ve come of age since the 2008 financial crisis had not previously experienced significant volatility until 2018. It’s not about the upside. Everyone wants to make money. It’s really about the downside. How much are you willing to lose? However it’s done, the participants agreed that women would be better served focusing on financial objectives rather than performance. That’s a lesson all investors can take to heart. Bloomberg, Dress for Success Worldwide, Matthews Asia, and Virtu Financial are separate and unaffiliated companies from E*TRADE Financial and its affiliates (“E*TRADE”).